de Havilland Mosquito FB Mk.VI interior 1/24 (designed to be used with Airfix kits) NOVEMBER RELEASE. EXPECTED TO ARRIVE LATE OCTOBER!!! 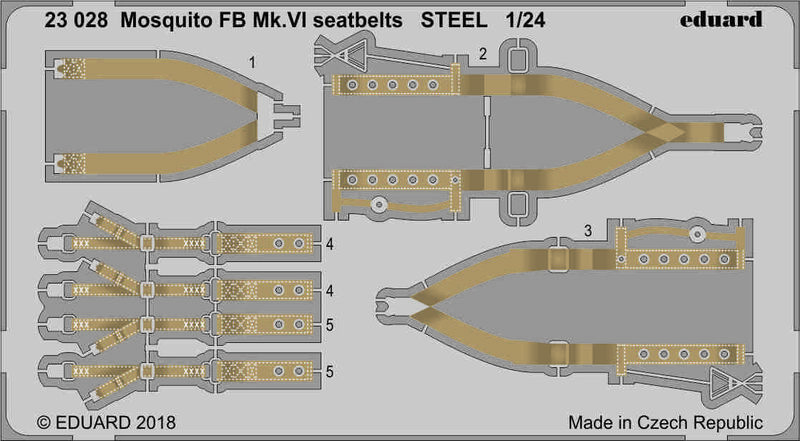 de Havilland Mosquito FB Mk.VI seatbelts STEEL 1/24 (designed to be used with Airfix kits) NOVEMBER RELEASE. EXPECTED TO ARRIVE LATE OCTOBER!!! 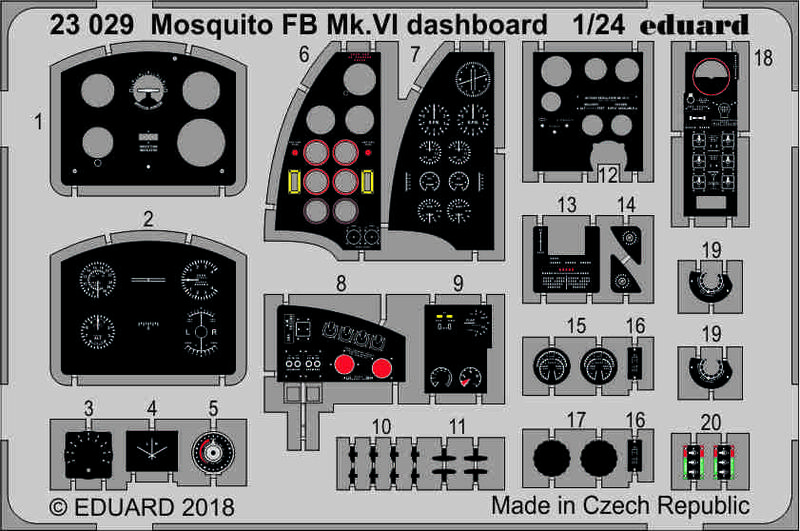 de Havilland Mosquito FB Mk.VI dashboard 1/24 (designed to be used with Airfix kits) NOVEMBER RELEASE. EXPECTED TO ARRIVE LATE OCTOBER!!! de Havilland Mosquito FB Mk.VI radiators 1/24 (designed to be used with Airfix kits) NOVEMBER RELEASE. EXPECTED TO ARRIVE LATE OCTOBER!!! de Havilland Mosquito FB Mk.VI 1/24 (designed to be used with Airfix kits) NOVEMBER RELEASE. EXPECTED TO ARRIVE LATE OCTOBER!!! de Havilland Mosquito FB Mk.VI TFace 1/24 (designed to be used with Airfix kits) NOVEMBER RELEASE. EXPECTED TO ARRIVE LATE OCTOBER!!! As I have the humungous Mossie in the stash, some of these will come in VERY useful! I wonder why this took them so long; they usually jump all over a kit like this long before now. 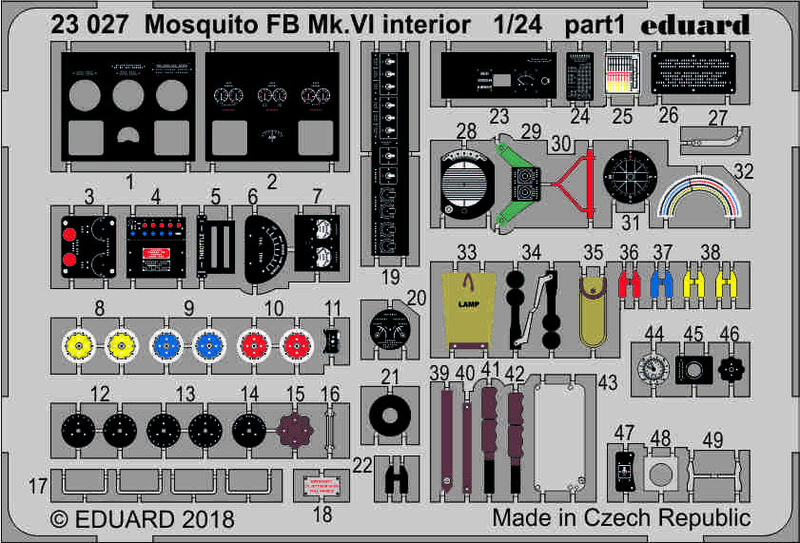 Just in time for me, as I decided on the Mozzie for the new GB starting 01/01/2019. Like I said .. weird! I just looked up my build and it was seven years ago! I'm not so sure this needs any am stuff. The Ip from the box is superb and builds easily into a really good looker. I thought we had moved on from those things ? Radu's paper jobs are far easier to work with. I think people should get the kit and then have a good look and decide if it really needs all the additional stuff. I agree with regards to the IP, the rest for the interior, radio etc, could come in handy, as well as the radiators. Let's judge when they release it. Well that's good news I reckon. Dosent RB do radiators already? And lovely job you did there Phil!! A little update. Please see some pics below: This is all I have for now, there are 3 more but no pics as yet. The steel belts look interesting and very different from anything I have seen before. That might just follow soon. From my previous build, with the wheel wells, apart from some strengthening ribs and the brackets for the gear door springs which could be done with pe, most of the additions are 3D stuff like a proper retraction jack brace, pipework, springs and brake lines etc. The landing gear doors and bomb bay doors lack the excavations for the tires and the aft bombs.